that report snakes had a controversial single origin (Lee and Caldwell 2000, Lee and Scanlon 2002), the large reptile tree recovers a heretical two origins for modern snakes. One set of snakes, led by the Gila monster, Heloderma, are largely burrowing forms, such as Cylindrophis, with increasingly odd jaws that ultimately rotate medially, like Leptotyphlops. The other set of snakes, led by leggy Ardeosaurus and the elongated marine Adriosaurus (Fig. 1) ultimately led to non-burrowing snakes, like Boa and Pachyrhachis. Today we’ll look at the reduction of the forelimbs in various species of Adriosaurus (Fig.1) as documented in Palci and Caldwell (2007). 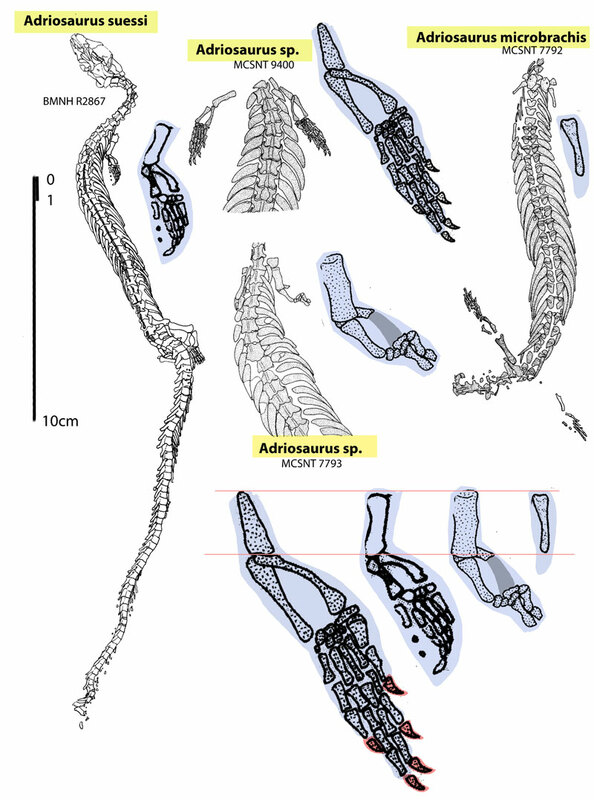 as noted by Palci and Caldwell, this forelimb reduction in Adriosaurus may be the sequence in which protosnakes lost their forelimbs, OR it may be a parallel and convergent sequence, since limb loss happens so often in elongated lepidosaurs (like skinks that evolve to become amphisbaenids). Figure 1. Click to enlarge. From Palci and Caldwell 2007, various specimens of Adriosaurus documenting the reduction of large clawed hands to small clawless paddles, then ultimately disappearing completely. Below, all the humeri are scaled to the same length. This blog and ReptileEvolution.com are devoted to showing and explaining the gradual accumulation of derived traits (which sometimes includes loss of bones). Sometimes no explanation is necessary as the series in Adriosaurus (Fig. 1) so grandly shows. that despite the major differences in fore limb morphology in these Adriosaurus specimens, all four are considered congeneric by Palci and Caldwell 2007. Earlier I posted three phylogenetic matrices on MorphoBank.org. Several interested parties downloaded work from there. Recently, however, the regents there decided they wanted to restrict posted matrices to those that had been peer-reviewed and published. So, my matrices are no longer available there. Nevertheless, anyone interested can always write to me directly through this website and request a matrix. Lee MSY and Caldwell MW 2000. Adriosaurus and the affinities of mosasaurs, dolichosaurs, and snakes. Journal of Paleontology 74:915-937. Lee MSY and Scanlon JD 2002. Snake phylogeny base on osteology, soft anatomy and ecology. Biological Reviews 77:333-401. Palci A and Caldwell MW 2007. Vestigial forelimbs and axial elongation in a 95 million-year-old non-snake squamate. Journal of Vertebrate Paleontology 27(1):1-7. I’m simply promoting DGS whether done by my hand or others. In this case Fischer et al. 2013 did a great job of delineating bones in their Russian ichthyosaur skull (Fig. 1). They started with a photograph of Leninia stellans, then traced it. The process of tracing and coloring to segregate bones actually helps the human mind to figure out difficult sutures. That’s the value of color-coding the bones as done here (Fig. 1). Figure 1. 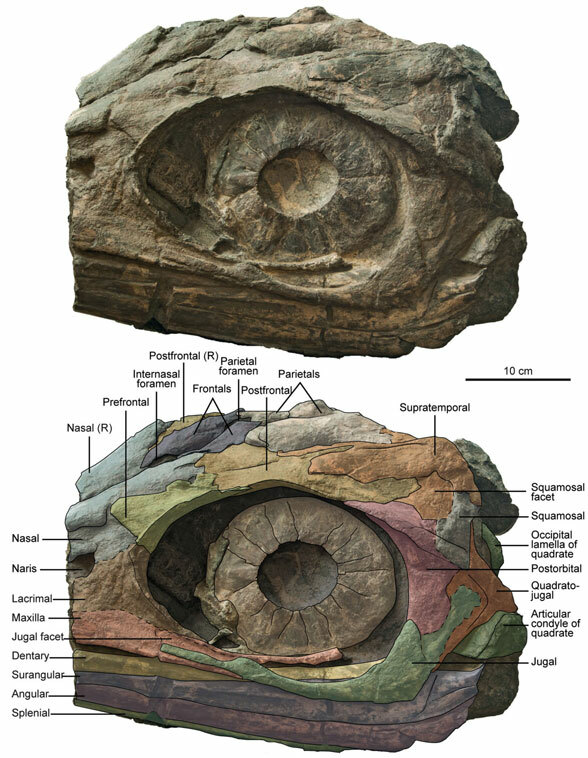 Russian ichthyosaur skull color coded using DGS to illustrate bone dimensions and sutures. All fossils could benefit from this technique. Much better than simple arrows without suture lines. The upper temporal fenestra are not absent. They are situated low behind the postfrontal and supratemporal and visible in dorsal view. I think there can be no clearer way to show the bone interpretations than this. The paper includes top and occipital views using the same technique. DGS has value. It should be widely used. Those who dismiss this technique need to show a reason why this doesn’t work. I encourage my readers, if they have not already done so, to check out My Life as a Turkey online at PBS (Fig. 1, click here). They’re curious, affectionate, loyal and when they hit puberty all hell can break loose. They’re beset by enemies and they learn to control their enemies. They are hit with disease and they mourn their losses. Some are independent. Others, from the same brood, seek touch. Watch them learn to fly, loose their cuteness, play with the mammals and, in the end, go out on their own. Click to go to online video at PBS/Nature. My Life as a Turkey explores the ontogeny of these little dinosaurs as thoroughly as I’ve ever seen. Azhdarchids: more like storks? or more like ground hornbills? Figure 1. A selection of wading storks. With their long necks and long legs, these waders seem to resemble little azhdarchids as seen in figure 3. Witton and Naish (2008) continue to insist that long-legged azhdarchids (Fig. 3) were more like short-legged ground hornbills (Fig. 2), down to their terrestrial stalking habitat and diet. A minor back and forth has started to brew in their PLoS comments section. I still think there’s still a case to be made for azhdarchids more like modern storks and herons (Fig. 1), including a wading habitat and diet. Here are a few images for direct comparison. 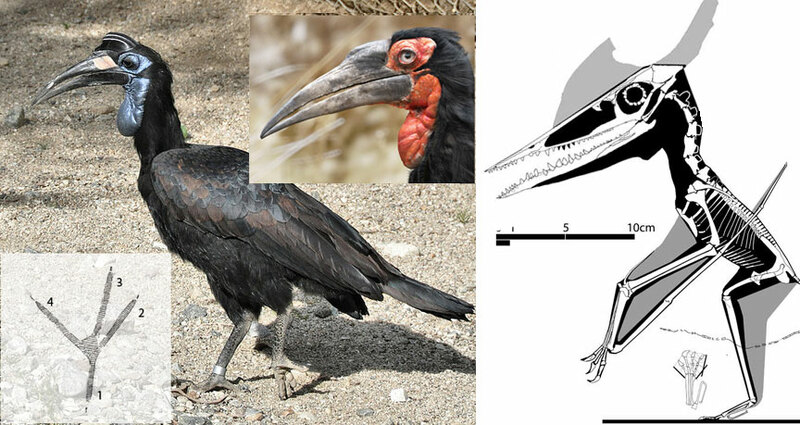 I think ground hornbills can be more accurately compared to Germanodactylus (Fig. 2) than any azhdarchid. Agree? Not sure why Witton and Naish (2008) overlooked this rather obvious match, other than playing favorites with azhdarchids for their grandeur and the possibility of wolfing down baby sauropods. Figure 2. Click to enlarge. Ground hornbills compared to a Germanodactylus, JME Moe-12. Ground hornbills are more like mega-crows than storks. The long legs and long neck of azhdarchids is not duplicated in ground hornbills. Witton and Naish also thought that pterosaur waders would need large webbed feet. While that makes perfect sense, it’s not true among living birds. For instance, the wading stilts have small slender toes without webbing, falsifying their assumption. Witton and Naish thought that the spreading toes in the stilt bird made all the difference. However, known wading pterosaurs, like Pterodaustro, also lack webbing (it has not been preserved) and have parallel toes leaving little room for webbing in any case, similar to azhdarchids. Figure 3. Click to enlarge. 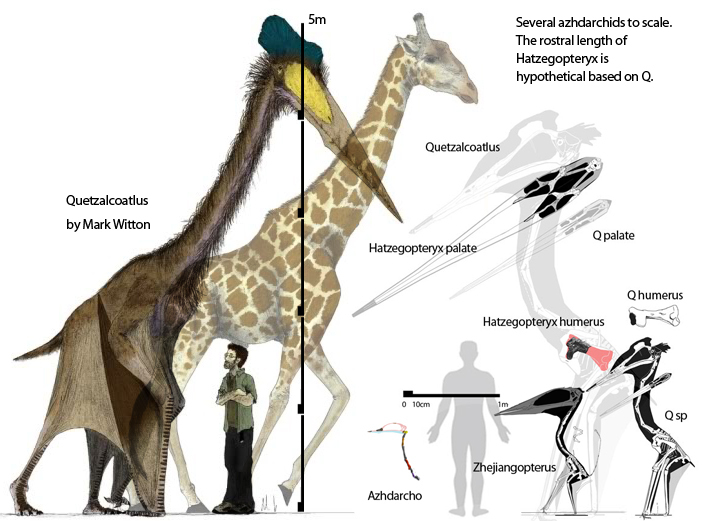 On the left, Mark Witton’s version of a large Quetzalcoatlus at 5 m tall, next to a giraffe and 6 foot tall human. 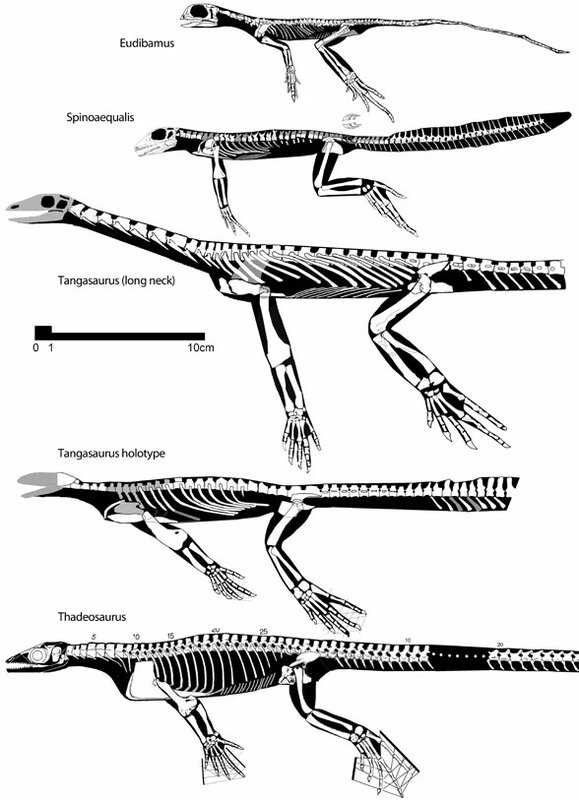 On the right are a selection of azhdarchids to the same scale from reptile evolution.com. Please ignore the wing membrane connection to the shin on the Witton reconstruction. It is an error that Witton continues to promote. It is noteworthy that azhdarchids have heron-like proportions and likely a similar wading lifestyle. We looked at azhdarchid wading postures and the evolution of gigantic size earlier here. We looked at the potentially largest azhdarchid, Hatzegopteryx (Fig. 3), here. Earlier we looked at how often bipeds give rise to aquatic taxa. Today we’ll look at the base of the Diapsida, the clade that includes Petrolacosaurus, enaliosaurs, protorosaurs and archosauriforms and does not include lepidosaurs (which are not related and arrive at the diapsid configuration by convergence). Figure 1. The base of the archosauromorph Diapsida, compressed to delete derived Enaliosauria. Here Eudibamus, Spinoaequalis, Tangasaurus and Thadeosaurus are basal to several major clades. begins with these few taxa derived at the base of their several clades: Eudibamus, Spinoaequalis, Tangasaurus and Thadeosaurus (Fig. 2). Milleropsis is the proximal outgroup. Eudibamus and Spinoaequalis nest at the base of the araeoscelids, which soon became extinct. The two Tangasaurus nest at the base of the aquatic enaliosaurs, which became extinct at the close of the Cretaceous. Thadeosaurus nests at the base of the protorosaurs and archosauriforms which are alive today in the form of birds and crocs. Figure 2. Basal archosaurmorph diapsids, including Eudibamus, Spinoaequalis, two Tangasaurus and Thadeosaurus to scale. These are all sister taxa. The tangasaurs are basal to the aquatic enaliosaurs. Thadeosaurus is basal to protorosaurs and archosauriforms. Eudibamus and Spinoaequalis are basal to araeoscelids. These four Permian taxa are all about the same size and have a lizardy appearance, but they are not related to lizards. The hind limb and foot are larger than the forelimb and hand. Pedal digit 1 is quite short and pedal digit 5 is quite long. The ilium is elongated, chiefly posteriorly. The limbs are gracile in most cases, the long-neck Tangasaurus the exception. The humerus is much broader distally in all. Hemal arches are deep in all except Eudibamus. The pubis has a dorsal process in all taxa. The manus is sub equal in length to the ulna. The pes is subequal in length to the tibia. None of these taxa had large teeth. Figure 2. Tangasaurus specimens in dorsal view. They are both wide, like pancakes, with very wide anterior caudal verts. Those are ribs on the holotype (above), gastralia on the long neck specimen (below). Those large caudal ribs (transverse processes) anchor strong hind limb muscles. Those large coracoids and that large sternum anchor strong forelimb muscles. The skull is poorly known in several of these taxa. The cervicals are robust in most cases, Spinoaequalis and the Tangasaurus holotype are the exceptions. The scapulocoracoid is fused only in Thadeosaurus. Currie (1982) reports more than 300 specimens of Tangasaurus and the related but more aquatic Hovasaurus are known, but none preserve the entire skull. These taxa are rarely studied but they are key basal taxa in each of their clades and united by their diapsid ancestry. Probably all were active and speedy insect-eaters, whether terrestrial or aquatic. The lateral toe is much longer in these taxa, inherited from Milleropsis. It remains long in enaliosaurs, like mesosaurs and thalattosaurs. Pedal digit 5 becomes much shorter in Eudibamus (Fig. 1) and other araeoscelids and, by convergence, following Thadeosaurus and its terrestrial descendants. Figure 1. 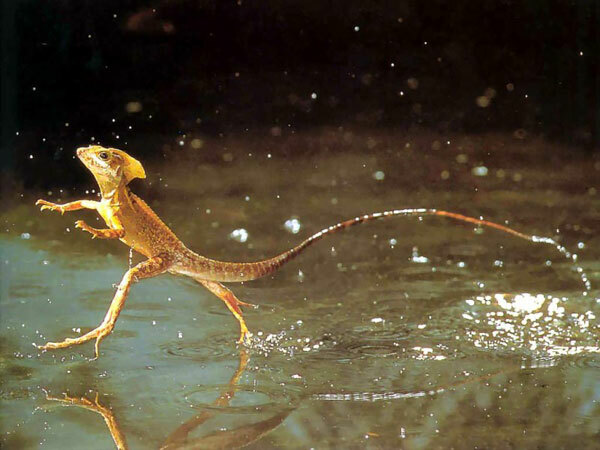 Basilisk walking on water. The extant basilisk runs bipedally through water, keeping its torso above the surface. From Wikipedia, “Once a basilisk submerges, it continues swimming. Although this lizard stays close to water to escape terrestrial predators, it swims only when necessary because some other aquatic animals would eat the basilisk given the chance.” The soft tissue crests are sexually dimorphic. Eudibamus was found in an upland paleograben containing no aquatic vertebrates. Thadeosaurus was found in split nodule in a rapidly filling deep rift valleys in Madagascar, some open to the sea. The presence of oolites replaced with collophane suggests a rich phosphate source, such as deep marine upwellings, similar to the situation of Galapagos marine iguanas. Milleropsis was also found in a split nodule that contained several specimens all living together, something that likewise occurred in Heleosaurus, its phylogenetic ancestor. Berman, DS, Reisz RR, Scott D, Henrici AC, Sumida SS and Martens T 2000. Early Permian bipedal reptile. Science 290: 969-972. Carroll RL 1976. Galesphyrus capensis, a younginid eosuchian from the Cistephalus zone of South Africa. Annals of the South African Museum 72: 59-68. Currie PJ 1984. 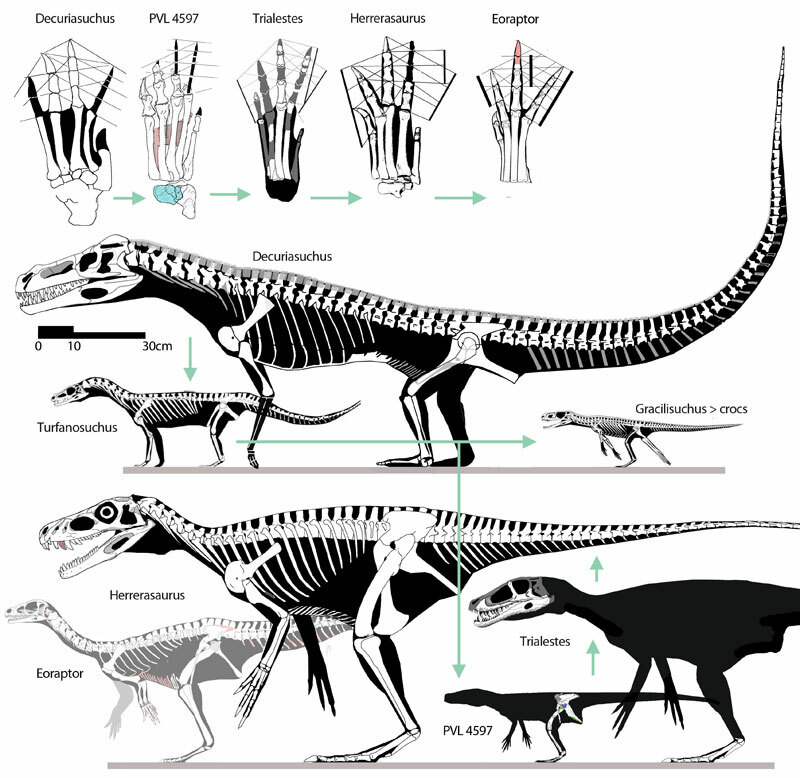 Ontogenetic changes in the eosuchian reptile Thadeosaurus. Journal of Vertebrate Paleontology 4(1 ): 68-84. Haughton SH 1924. On Reptilian Remains from the Karroo Beds of East Africa. Quarterly Journal of the Geological Society 80 (317): 1–11. Reisz RR, Modesto SP and Scott DM 2011. A new Early Permian reptile and its significance in early diapsid evolution. Proceedings of the Royal Society B 278 (1725): 3731–3737. Dinosaurs became initially successful (at least in part) due to their bipedal configuration (discounting those that later readopted a quadrupedal configuration). Of course, their genesis as bipeds is mirrored by a similar genesis in bipedal crocodylomorpha, also developing tiny to no calcaneal tubers. Today we’ll look at the evolution of the foot in basal dinosaurs and their immediate precursors (as determined by their nesting in the large reptile tree). The phylogenetic order (Fig. 1) is 1. Decuriasuchus > 2. Turfanosuchus > 3. PVL 4597 4. Trialestes and > 5. Herrerasaurus. Figure 1. Click to enlarge. The origin of dinosaurs, with a focus on their feet. 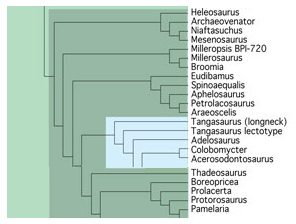 Here are Decuriasuchus, Turfanosuchus, Trialestes and Herrerasaurus in phylogenetici order (green arrows) and to scale. Note the shortening of pedal digit 1 and the reduction of pedal digit 5. The tarsus (ankle bones) also become smaller in the evolution of dinosaurs. The metatarsals become more closely appressed in only certain dinosaurs, like Eoraptor. Gracilisuchus is shown (Fig. 1) representing basal crocs. Eoraptor is shown representing basal phytodinosaurs. Dinosaurs evolved from basal rauisuchids. Decuriasuchus is just such a basal rauisuchid, derived from a sister to Vjushkovia and representing a splinter off the main branch of other, more typical rauisuchids, like Prestosuchus. In Decuriasuchus the cervicals were longer. The torso was longer. The tarsus was large. The calcaneal tuber was robust. Metatarsal 5 was hooked and the remaining metatarsals were subequal and not compressed to one another. The toes were longer than in other rauisuchids. These changes represent the first stages toward a dinosaur morphology. 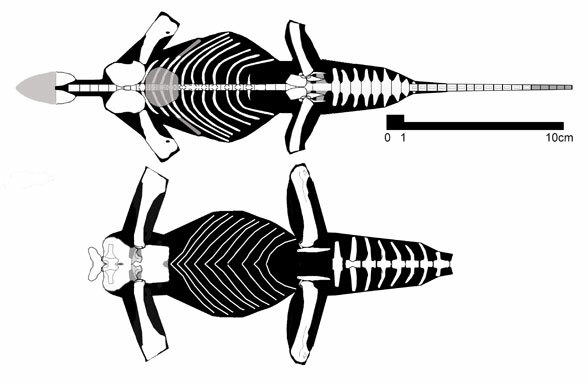 Turfanosuchus is a much smaller rauisuchian with relatively smaller head, longer neck, shorter tail and longer limbs. The feet are unknown, despite model reconstructions that show them. Further size reduction produces Gracilisuchus and PVL 4597. This is where crocs split from dinos at the base of the Archosauria and a bipedal configuration is only experimental. The torso is shorter. The forelimbs are shorter. The ilium is much enlarged. The pubis orientation is ventral. The tarsus and calcaneal tuber are relatively smaller. The elements likely produce a simple hinge ankle joint as the base of all five metatarsals are aligned and metatarsal 5 is no longer hooked. Distal phalanges for digits 3 and 4 are unknown, but if they follow digit 2 they are shorter than the proximal phalanges. Digit 5 likely has no ungual due to its spherical tip. In Gracilisuchus and most crocs, digit 5 is absent. So much of Trialestes is known, but not illustrated. What bits and pieces of the foot that are illustrated confirms long slender compact metatarsals and short distal phalanges. Further size enlargement produces Herrerasaurus. More completely known is Herrerasaurus, a basal dinosaur in which metatarsals 1 and 5 are more gracile and shorter, yet the foot is overall broader. Metatarsal 4 is once again shorter than 3. The calcaneum is greatly reduced, essentially a vestige, and without a tuber. This is a simple hinge ankle joint. The foot of Eoraptor is essentially the same, but with a more compact and waisted metatarsus. Metatarsal 5 is a vestige. analyses that nest Lagerpeton and pterosaurs with dinosaurs (like Nesbitt 2011 and Brusatte et al. 2010) are in great need of a larger taxon list that nest these unrelated taxa elsewhere. the bipedal basal croc, Scleromochlus, is most closely related to Gracilisuchus, among the above listed taxa. So Scleromochlus is close to, but slightly off the main line leading to dinos. Figure 1. Hatzegopteryx elements to scale with the more completely known Quetzalcoatlus sp. and Quetzalcoatlus northropi (largely hypothetical). Scaling up Q. sp. to the size of Quetzalcoatlus puts the humerus to the size of Q. northropi and Hatzegopteryx (based on the partial humerus). However the hypothetical skull of Hatzegopteryx, based on the pterygoid/quadrate is both much wider and much longer than the scaled up Q. northropi skull. A bigger skull means a more robust neck for Hatzegopteryx, etc. etc. — which gives it less of a chance of flying due to its greater mass and no greater humerus. Zhejiangopterus and Azhdarcho also shown to scale. Zhejiangopterus also has a relatively larger skull and smaller humerus, but has no other flightless traits, like a large torso or robust skeletal elements. Based on the humerus, Hatzegopteryx (Buffetaut et al. 2003, Fig. 1) was no larger than Quetzalcoatlus northropi (Lawson 1975), one of the largest pterosaurs of all time. However, based on the pterygoid / quadrate and jugal (Fig. 1), Hatzegopteryx was much larger (if the skull and rostrum had similar proportions to Q. northropi), based on the scale bars. We have a good narrow mandible for Q. sp. (Kellner and Langston 1996). We also have its palatal elements. The pterygoid and humerus are the only bones both taxa share in common. These few elements, along with the scale bars, form the basis for these largely hypothetical reconstructions and restorations (Fig. 1). It’s hard to figure out what the rest of the pterosaur looked like based on just a few palatal bones. But it appears that the much larger skull of Hatzegopteryx might tip the scales toward flightlessness. If so, Hatzegopteryx would not be the first flightless pterosaur known. That honor goes to JME Sos 2428 (Peters 2013), a Late Jurassic protoazhdarchid. That robust jugal counts too. The jugal of Hatzegopteryx was not a fragile, slender bone, but a robust one, according to Buffetaut et al. (2002). So Hatzegopteryx was not trying to save weight by having paper thin bones. Hatzegopteryx was found in the upper part of the Middle Densus-Ciula Formation (Upper Cretaceous, Late Maastrichtian). Holotype (FGGUB R 1083): fragments of a skull and associated partial humerus. Referred material: Femur (FGGUB R 1625). Figure 2. Hatzegopteryx humerus restored to follow Quetzalcoatlus northropi. Buffetaut et al. did not provide a sufficiently robust shaft compared to the photo. 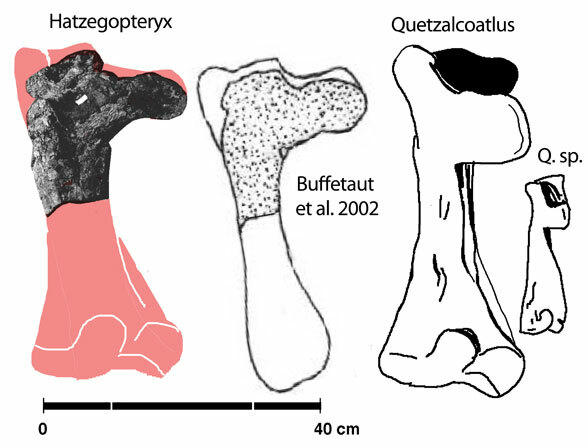 There is no preserved indication of a posterior tuberosity of the humerus, as shown in Quetzalcoatlus and Pteranodon. The cross-section of the shaft near the deltopectoral crest was round, not hollowed out as in Quetzalcoatlus and Pteranodon. There is no indication of a typical shoulder joint, as in flying pterosaurs. Those parts may be worn away. Figure 3. Click to enlarge. 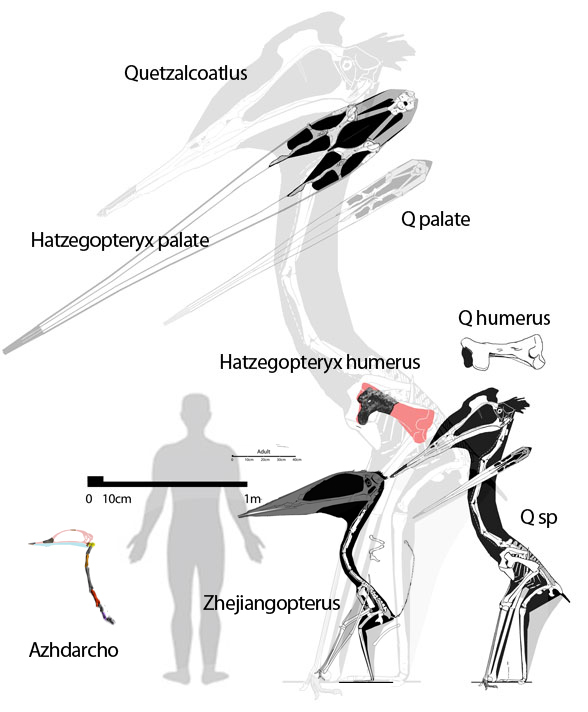 Hatzegopteryx palate elements added to Quetzalcoatlus species elements and vice versa. The basisphenoids have not been documented in azhdarchids or sister taxa, but appear to be paired rather than single, as Buffetaut et al. proposed. Paired elements are primitive and are found in Dorygnathus, the closest known sister with these elements visible. 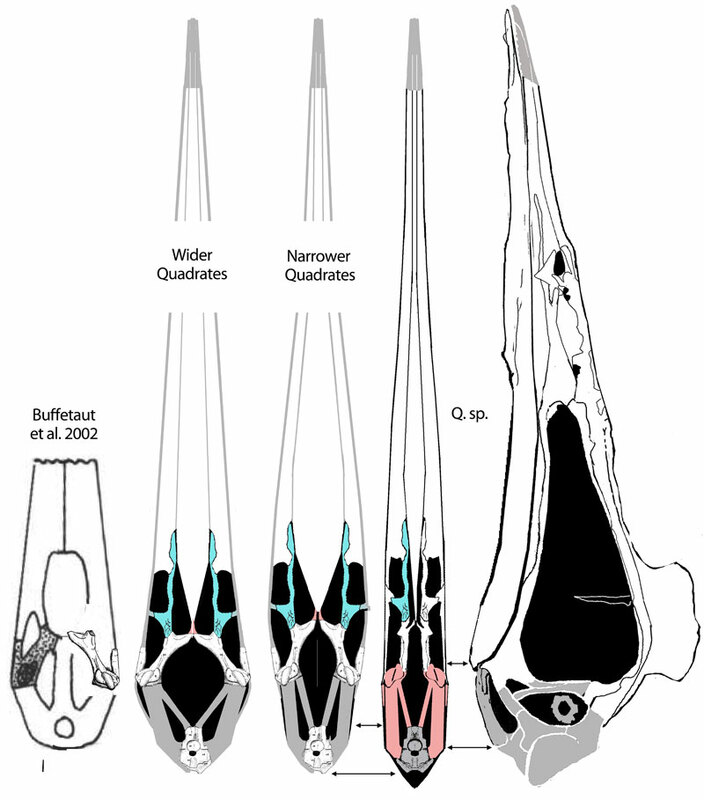 The basisphenoids in basal pterosaurs are paired and connect the braincase to the quadrate/pterygoid suture. In certain derived forms the basisphenoids merge. Buffetaut et al. imagined that they merged, as they do in Pteranodon, but no azhdarchid shows that and the base of the occiput appears to have paired basisphenoid breaks, not a single one. Pteranodon had a much narrower occiput, more appropriate for a single basisphenoid. Buffetaut E, Grigorescu D and Csiki Z. 2002. A new giant pterosaur with a robust skull from the latest Cretaceous of Romania. Naturwissenschaften, 89(4): 180-184. Buffetaut E, Grigorescu D and Csiki Z 2003. Giant azhdarchid pterosaurs from the terminal Cretaceous of Transylvania (Western Romania). In: Buffetaut E, Mazin J-M, eds. Evolution and Palaeobiology of Pterosaurs, Geological Society of London, Special Publication, 217, (2003) pp 91–104. Kellner AWA and Langston W 1996. Cranial remains of Quetzalcoatlus (Pterosauria, Azhdarchidae) from late Cretaceous sediments of Big Bend National Park, Texas. – Journal of Vertebrate Paleontology 16: 222–231. Lawson DA 1975. Pterosaur from the latest Cretaceous of West Texas: discovery of the largest flying creature. Science 187: 947-948. Peters D. 2013. A flightless pterosaur. Journal of Vertebrate Paleontology supplement program and abstracts: 191.